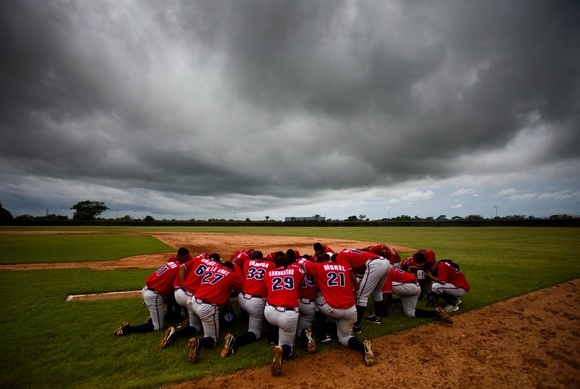 There are two religions in the Dominican Republic, Catholicism and baseball, but the latter dominates. Grown men gather in corner bars and bodegas in every town to watch games, while outdoor spaces in Santo Domingo are filled with young boys swinging sticks at bottle caps. No Latin American nation produces more Major League players. In an impoverished country, hopes of securing a lucrative professional contract in the United States represent dreams of a life transformed – dreams that have driven the growth of youth development programs presided over by ‘bosses’ looking to capitalize on a burgeoning export industry. Photography Courtesy of Michael Hanson. To view the full photo essay, subscribe or order a copy of The Global Journal.